I blame the heat. Why else would I make a recipe like this – one that I KNOW TheBetterHalf and I will have absolutely no self control around?? This past week, we had a heatwave in NYC, and it made all of us a little crazy. Most Saturdays I will bake a loaf of bread or some muffins or a coffee cake, things that are delicious, but that I can usually stop eating after one or two pieces. Not this past Saturday…it was WAY too hot to turn on the oven. So I had the brilliant idea of making this no-bake recipe. This recipe is essentially a homemade Reese’s Peanut Butter cup, and it makes a whole tray of them! I’m not sure if you have noticed yet, but chocolate peanut butter is our absolute favorite dessert combination. And these bars are amazing!! I knew before I made them that I would not be able to stop eating them. But I decided to make them anyway. And I’m very glad that I did. 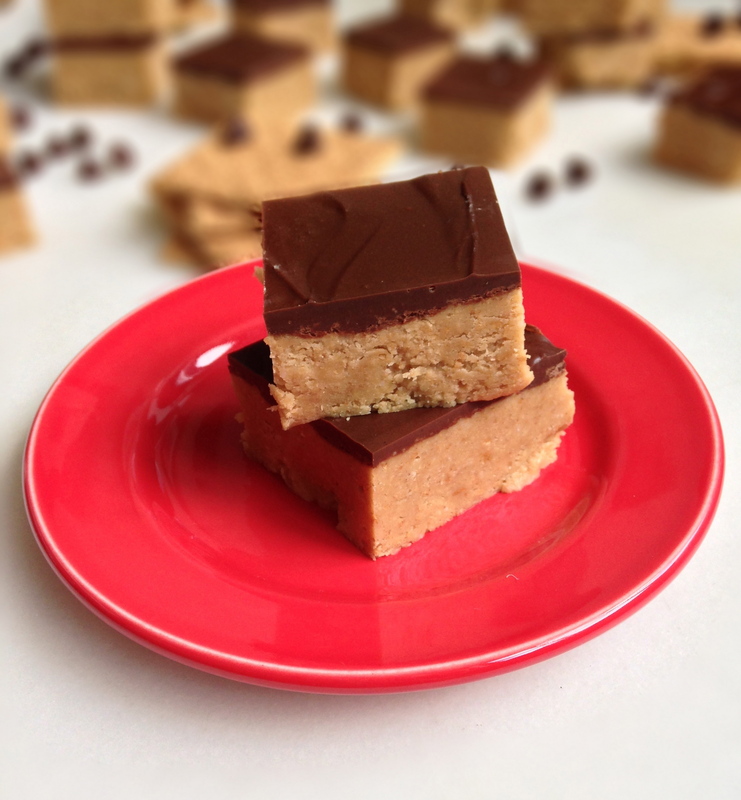 A sweet and salty peanut butter bar topped with chocolate – what’s not to love?! They are so good, but so dangerous! That darn heat totally ruined any kind of healthy eating plan I had in mind for the weekend. Oh well, I guess that’s why they invented treadmills! Line a 9×9 inch square pan with aluminum foil, and spray the foil with nonstick cooking spray. Melt the butter in a large, microwave safe bowl. Stir in the graham cracker crumbs, sugar, and salt, then stir in 1 cup peanut butter. Mix until well-combined. Spread the mixture in your prepared pan, and chill in the refrigerator for about 20 minutes. Melt the chocolate chips with 1 Tbsp peanut butter. Spread the chocolate evenly over the peanut butter. Chill the bars for at least one hour. Cut into bars and enjoy! Note: These are best served chilled. They start to get a bit messy when they come to room temperature! I was going to freeze them to prevent myself from eating them!! guess that won’t work…. These look great! Can’t wait to try them – terrific photos, too! I totally know about not wanting to turn the oven! These look like a fab recipe! Thank you!! It is just too hot for the oven sometimes! They have my name written all over them!